Fans of Texas-style brisket and maple-glazed baby-back ribs will find much to like at Burlington’s favorite smokehouse. 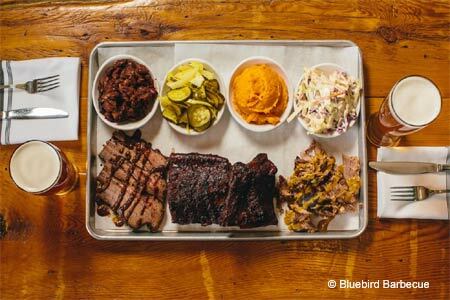 : With bright blue vinyl tablecloths and mustard-colored walls, Bluebird Barbecue’s vibe is Southern-inspired without any gimmicks. Chef Michael Clauss, once executive chef at Daniel Boulud's catering company in New York, brings a creative twist to regional barbecue. Start with the cheddar curd-topped pulled pork poutine over hand-cut fries, or smoked mushrooms on toast anointed with a fried egg and smothered in onion gravy. For dinner, we recommend the barbecue for two: a choice of four sides and three half-portions of meat like bourbon-glazed smoked half chicken, maple barbecue mop baby-back ribs and Texas-style brisket smoked on-site for 15 hours. Ribs are juicy, tender and full of flavor. Brisket, while tasty, doesn't quite pack the punch we long for. Servers happily provide to-go boxes, so don’t be shy about taking leftovers home. There are tasty cocktails, cider and draft wine --- but go with the beer. The Northshire Equinox Pilsner, brewed in southern Vermont, is clean and light on draft, while the Alchemist’s Heady Topper (a renowned local favorite) is a hoppy double IPA served in a can. If beer is not your thing, try a mint julep or a pineapple margarita. For dessert, order a broken banana pie: crushed ginger snaps and fluffy whipped cream.